When the euro rallied last year, speculators were happy to ignore the region’s many underlying economic issues. Looking at the data, year-over-year GDP growth accelerated from 1.9% in Q1 2017 to 2.7% Q4 2017. Remarkably, the Eurozone grew at a faster clip in late 2017 relative to even the United States. Thanks to the euro’s ‘risk on’ qualities, the currency tends to strengthen in response to accelerating economic growth in the region. Following many quarters of significant gains, few expected a slowdown. 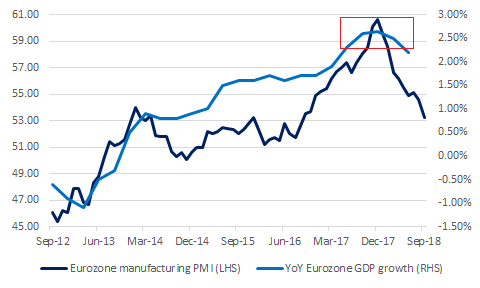 Note that we warned Eurozone growth was set to deteriorate significantly last April (just before the euro began weakening). Looking ahead, we expect the deteriorating downturn to reveal significant issues in the Eurozone. Specifically, the Eurozone is increasingly vulnerable thanks to rising debts, weak demographics and an excessive reliance on its trade surplus (particularly with the United States and the United Kingdom). As economic data from the region continues to deteriorate, expect these issues to dominate investor concerns. As can be seen above, both manufacturing sentiment and economic growth accelerated by a significant degree following Macron’s victory in the second quarter of 2017. In response to improving data, EUR/USD rallied sharply as a result. After peaking in Q4 2017, sentiment has now deteriorated sharply. Going forward, upcoming Eurozone GDP growth rates will have to contend with steepening base effects. Put another way, an acceleration in year-over-year growth is mathematically more challenging in Q3/Q4 2018 as growth was high at this point last year. Beyond math, the Eurozone’s export-oriented manufacturing sector is also running out of steam. Between weakening growth drivers and tough math, economic growth is likely to keep slowing. As Eurozone growth continues to slow, the region’s weaknesses are now in focus. In recent history, financial media outlets have been focused on the Italian government’s new budget. As the anti-establishment government pushes for higher government deficits, Italian financial assets have been tumbling in response. While euro traders ignored the country last year, Italian political developments are now driving the euro. As can be seen above, non-performing loans in the Italian banking system began rising following the global financial crisis in 2008. At the height of the Eurozone crisis, the riskiest government bonds suffered significant weakness. In other words, the bond market was pricing in a good chance of bankruptcy and assigned many Eurozone governments ‘junk’ status. Instead of allowing any of its members to either declare bankruptcy or exit the monetary union, the ECB instead engineered a rescue. Its plan involved buying large quantities of Eurozone bonds using its balance sheet (i.e. quantitative easing) and reducing interest rates to ease borrower pain. This is why the ECB’s balance sheet grew significantly over the past few years. Instead of allowing any single member to devalue its currency (by exiting the monetary union), the euro itself weakened against other major currencies. Thanks to a weak euro, rising exports and stronger economic growth have helped keep non-performing loans in check. Looking at the graph above, Italian non-performing loans (as a proportion of total banking assets) peaked at 18% and have been declining since that time. 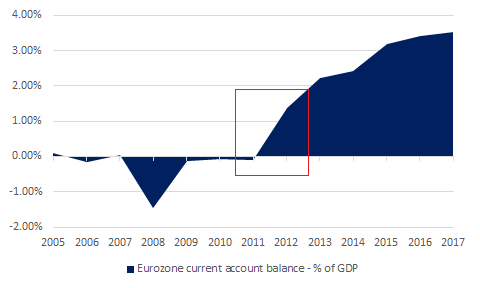 As can be seen above, the Eurozone’s current account balance (the sum of its trade balance and income from abroad) soared following the ECB’s actions in 2011 and 2012. Today, the same factors that caused the Eurozone crisis are starting to play out at a global scale. In the United States, President Trump is pursuing an ‘America First’ doctrine to reduce the size of the U.S. deficit. In the United Kingdom, Brexit was a powerful backlash against the current status quo. The U.S. and the U.K. maintain the world’s largest and second-largest current account deficits, respectively. Ultimately, countries with significant current account surpluses (such as Germany, Japan and China) remain exposed in the event of rising trade tensions. This is especially the case for the Eurozone as the region has used its current account surplus as a means of financing its significant underlying problems. Now that current account deficit countries are rebelling against the status quo, expect increasing tensions to weigh on the euro. 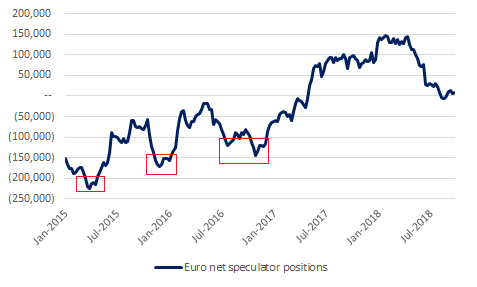 After speculators built up the all-time largest net long position in the euro in early 2018 (almost 150,000 contracts net long), speculators have reduced their long positions significantly since that time. Looking at recent history, speculators were short the euro to the tune of more than 200,000 contracts in early 2015. As recently as late 2016, speculators were short the currency by almost 150,000 contracts. If history is any guide, speculator positions have room to fall much further. In other words, the current speculator net position is no obstacle for further euro weakness. As the Warren Buffet saying goes: “Only when the tide goes out do you discover who's been swimming naked.” Now that the tide is going out, euro traders are about to discover the true extent of the Eurozone’s underlying problems. While we are not forecasting an imminent recession, the region’s weak fundamentals mean that the sell-off can worsen significantly. For now, the sell-off hitting Italian financial markets is an early warning sign of what may be coming. For traders looking to enter euro short positions, we recommend entering the trade at the top-end of our EUR/USD trading range, updated daily on our website. Deb founded MarketsNow after realizing that there was an opportunity to publish high quality financial market analysis that would help people make better decisions. Prior to MarketsNow, Deb worked in a variety of roles across financial services. Specifically, he worked in foreign exchange trading in Hong Kong (GAIN Capital), in international payments – also in Hong Kong (Forex.com Money Transfers, World First) and in technology venture capital in Canada (VantagePoint Capital Partners, Tandem Expansion Fund). He is a graduate of McGill University and the University of Hong Kong.